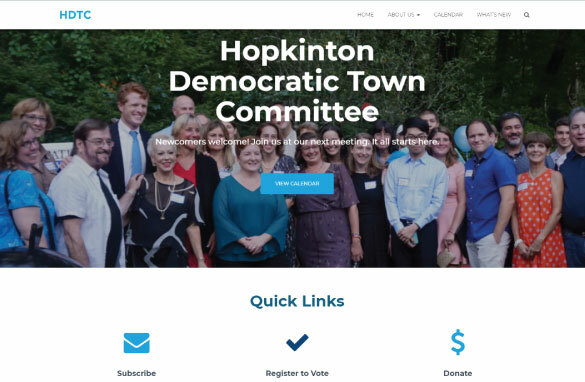 The HDTC is a political organization in Hopkinton. The site is designed in WordPress using a customized version of the theme Hestia by ThemeIsle. This entry was posted in Portfolio, Website Design on March 1, 2018 by amywebdesign. 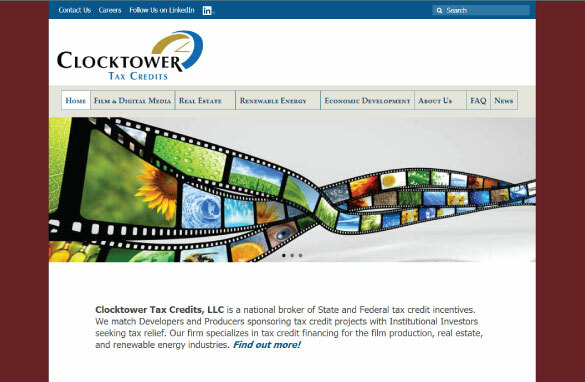 Clocktower Tax Credits is a broker of tax credit incentives in Maynard. The site is designed in WordPress using a customized version of the theme Virtue by Kadence Themes. This entry was posted in Portfolio, Website Design on August 25, 2017 by amywebdesign. 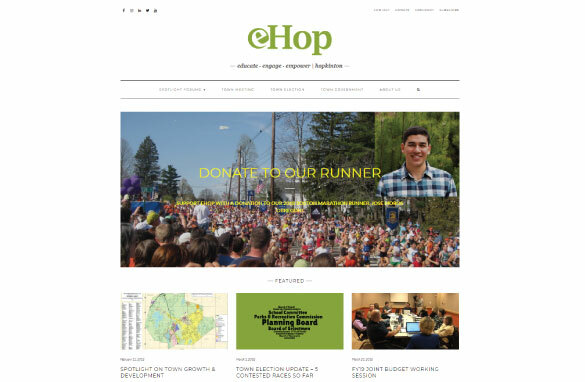 eHop | educate engage empower | Hopkinton is a non-profit civic league in Hopkinton. The website is designed using a customized version of the Kale theme by Lyra Themes. This entry was posted in Portfolio, Website Design on July 24, 2017 by amywebdesign. 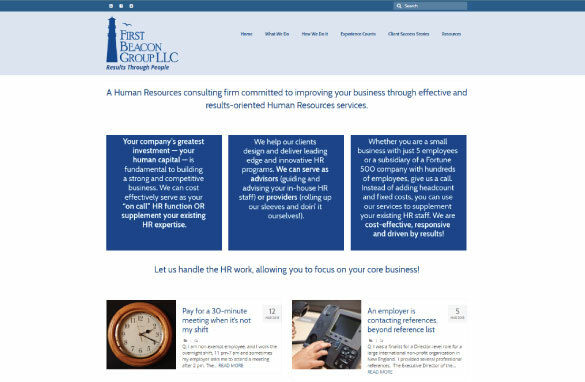 First Beacon Group is a Human Resources consulting firm in Hopkinton. The site is designed in WordPress using a customized version of the theme Virtue by Kadence Themes. This entry was posted in Portfolio, Website Design on June 15, 2017 by amywebdesign. 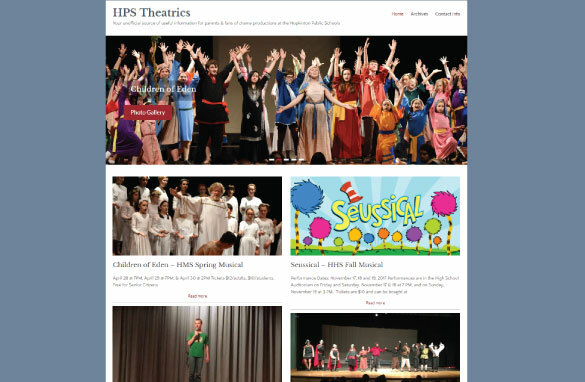 HPS Theatrics is a fan page for parents of students in the drama program at Hopkinton Public Schools. It is designed in WordPress using the theme Spacious by ThemeGrill. This entry was posted in Portfolio, Website Design on October 13, 2016 by amywebdesign. 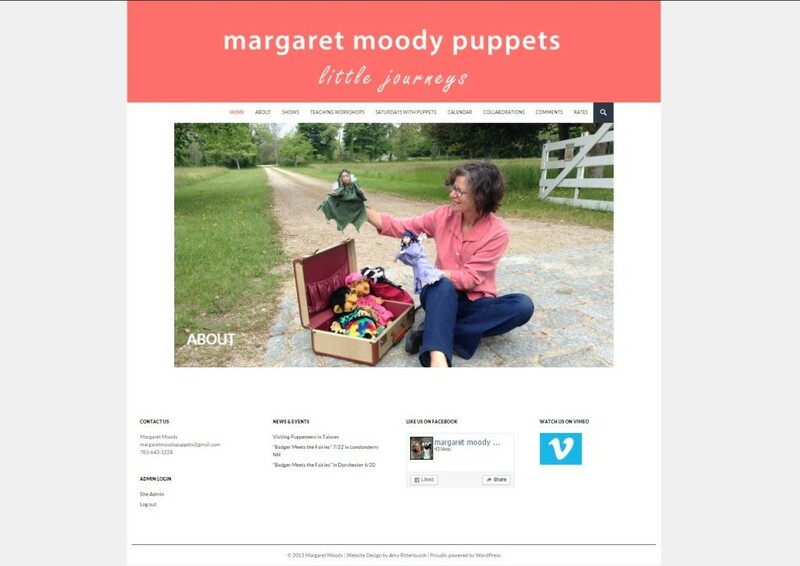 Margaret Moody Puppets is a local puppeteer from the Arlington, Massachusetts area. The website is designed in WordPress using a customized version of the WordPress theme Twenty-Fourteen. As all newer sites should be, it is fully responsive to look good on any device. We used a similar salmon color scheme to the WordPress theme Lingonberry, but the the functionality comes from Twenty-Fourteen. Margaret’s puppet shows are a lot of fun, be sure to check out “Saturdays with Puppets” at the Arlington Center for the Arts this winter. This entry was posted in Portfolio, Website Design and tagged Responsive Design, Twenty Fourteen, WordPress on October 23, 2015 by amywebdesign. 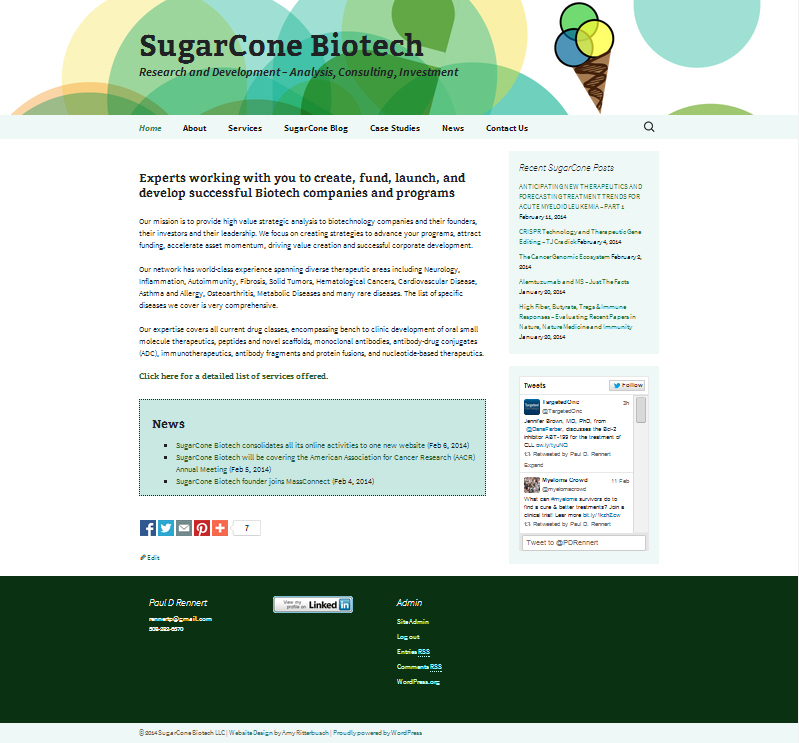 SugarCone Biotech is a local Biotech R&D Consulting firm, owned by Paul D Rennert and based in Holliston. Paul originally had a Blogger blog and a separate Google Site, and I helped him consolidate all his online activities into one website. This was my first new project of 2014. The website is designed in WordPress using a customized version of the WordPress theme Twenty Thirteen. The color scheme was inspired by Joen Asmussen’s green color theme for Twenty Thirteen. The Twenty Thirteen theme is fully responsive and looks good on any device. The site was designed so that the client can easily post new blogs and make text updates to the website himself. This was the first time I tried GoDaddy’s new “Installatron,” which automatically backs up your WordPress database at a regular interval specified by the client. It also saves multiple backup versions, so if something goes wrong, you can easily reload your site using Installatron from your GoDaddy account. WordPress 3.7+ automatically makes minor software updates in the background, so it is nice knowing a recent backup is available on GoDaddy, in case something unexpected happens with an update. Add Meta Tags By George Notaras | Visit plugin site – Allows you to add all kinds of custom meta tags, including Twitter cards, open graph, as well as the traditional title, description and keywords. Collapsing Categories By Robert Felty | Visit plugin site – If your post category list is too long, this allows you to collapse subcategories and only show the primary categories, with a [+] to expand them. It comes with a variety of customization options. Display Posts Shortcode By Bill Erickson | Visit plugin site – Allows you to display a list of posts on a page, similar to what is already available with WordPress.com blogs. It comes with a variety of customization options. TablePress By Tobias Bäthge | Visit plugin site – Paul uses data tables frequently in his blog posts. TablePress allows you to easily import a table from excel and offers a variety of display options. Tables however are not very mobile-friendly and if they have too many columns they do not display as nicely when viewed on a smartphone. However, I still think it is a great plug-in. This entry was posted in Portfolio, Website Design and tagged biotech, Responsive Design, Twenty Thirteen, WordPress on February 12, 2014 by amywebdesign. 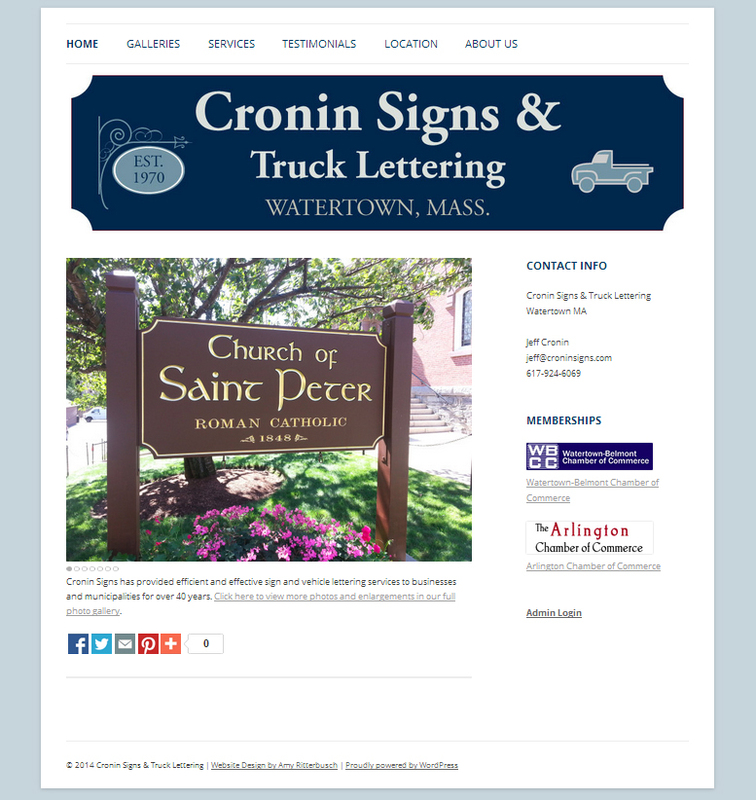 Cronin Signs & Truck Lettering is a local custom sign business owned by Jeff Cronin and based in Watertown, Massachusetts just outside of Boston. Jeff is easy to work with and had a lot of great photos of his work, which made the site easy to put together. The website is designed in WordPress using a customized version of the WordPress theme Twenty Eleven. The Twenty Eleven theme is fully responsive and looks good on any smartphone or tablet. The home page slideshow is made using the Meteor Slides plug-in, which functions really well and looks nice, but I find it a more time-consuming to set up than Portfolio Slideshow. The Galleries posts are made using the default WordPress Add Media > Create Gallery function, which is very easy and intuitive to use. My one complaint about the Create Gallery function is that although it allows you to sort and rearrange the thumbnails, when you open an image to get a closer look, the Previous/Next navigation sorts the photos in the order in which they were uploaded and this cannot be changed. So I had to be careful to upload the photos exactly in the order I wanted them to appear in the navigation. So if we add any new sign photos going forward, they will automatically go at the end of the navigation, unless we re-upload (and re-caption) ALL the photos in the new desired order. So while I generally recommend default Create Gallery for its ease of use, if you have a photo-heavy site and plan to frequently add new photos to your galleries, it may not be the right choice for you. This entry was posted in Website Design and tagged Business Services, Responsive Design, Signs, Twenty Eleven, WordPress on December 12, 2013 by amywebdesign. 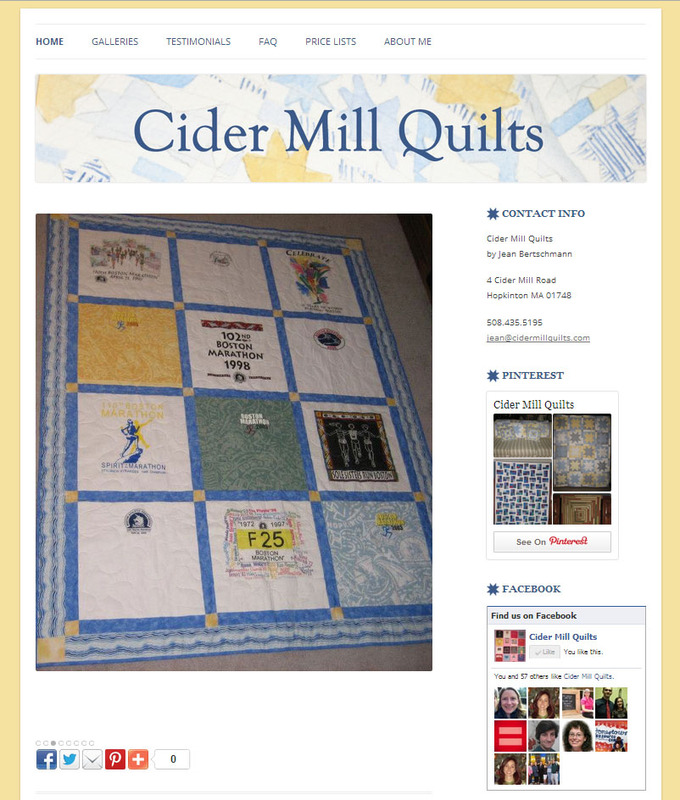 Cider Mill Quilts is a website I made for local quilter, Jean Bertschmann in Hopkinton. I completed this website in 2013. The website is designed in WordPress using a customized version of the WordPress theme Twenty Twelve. The Twenty Twelve theme is fully responsive and looks good on any device. The photo gallery and photo upload interface on Twenty Twelve is wonderful. The site was designed so that the client is able to update the website text and add quotes and photos herself. Jean had a lot of great photos of her quilts, which made the website easy to put together. This entry was posted in Portfolio, Website Design on March 27, 2013 by amywebdesign. 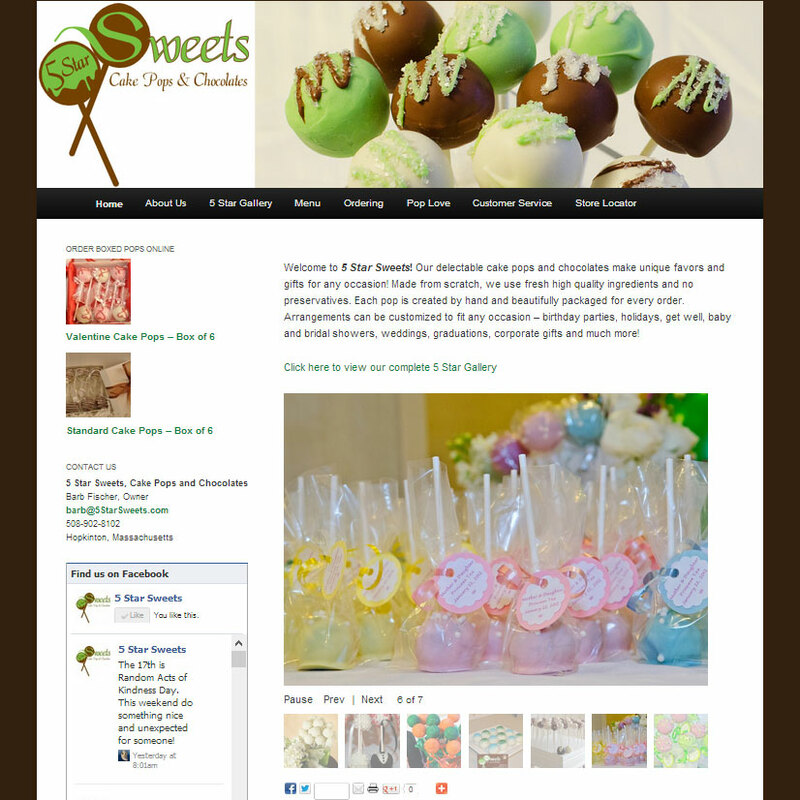 5 Star Sweets is a local bakery in Hopkinton that specializes in Cake Pops and Chocolates. I created this website for owner Barb Fischer in 2012. The website is designed in WordPress using a customized version of the WordPress them Twenty Eleven. The site includes the WP e-Commerce Shopping Cart by getshopped.org. The site was designed so that the client is able to update the website text and add photos herself, as well as add new products. This was one of my favorite websites on which to work. The cake pops are so creative and delicious. The wonderful photographs by Vicki Francis made it easy to design an appealing site. Having great photos to work with is a key factor in designing an attractive site. This entry was posted in Portfolio, Website Design on January 28, 2013 by amywebdesign.